Onstage and Backstage podcast from Hal Leonard is available on iTunes and Libsyn. Each episode authors and their guests have a chat about the topics of their books. Today, Bill Marx (son of Harpo) chats with Off the Meter host Jimmy Failla about Bill’s book Son of Harpo Speaks! (Applause Books). Son of Harpo Speaks!, in addition to offering a unique perspective of a very special man and revealing many stories never before in print, is also a book about a “too-Hollywood-to-believe” life-altering quirk of fate that ultimately brought him together with his parents. The background for this remarkable revelation unfolded unassumingly over a glass of wine and some conversation in the famous 1960s nightclub, Dino’s Lodge, on Hollywood’s Sunset Strip. It would subsequently lead the author to explore the complex life task of dealing with his emotional scars of rejection and the secure feelings of acceptance, the latter due to his overwhelmingly good fortune of having been adopted by two loving parents. What is your favorite memory of your dad, Harpo Marx? I have no real singular “favorite” memory of dad. He always made you feel comfortable with him, even on the occasion when he was angry with my behavior. (Of course, those times were fortunately very rare…heh, heh). So really, all of my memories are all my “favorites” because if you knew him, there were no surprises. Whatever it was, he always came straight from his heart. I suppose my most ingrained image of him was the vision of him after breakfast, practicing his music in front of the living room bay window, his harp resting gently on his shoulder as he transported himself to his other kind of surreal world. Out of all or your famous uncles, who were you the most close to and why? Gummo was the easiest to be with. He was soft spoken and pretty mellow. Groucho was the most intriguing of my uncles because he was a very unpredictable character. You had to be on your game at all times with Groucho. Though I toured with Chico and dad when I was but twelve, I believe maybe because of the 50 year generation gap between us, he was more or less indifferent to me, as he was usually in his own world with his peers, and rarely in good health, except when re-energized by any available Gin or Poker game. Zeppo, too, was usually in his own world with his peers and was difficult to get to know. However, my mom did have a wonderful relationship with his first wife, Marion. How did Son of Harpo Marx Speaks! come together and why did you decide to write it? I wrote Son of Harpo Speaks! for two reasons. Siblings of Groucho’s and Chico had written books about their father, but no one from Harpo’s family had done so. I thought it was time to complete the trifecta. Yes, there are new stories about the Marx Brothers never before published, and the close father/son and professional relationship dad and I shared together. But the book has another story that I hope people find very compelling; that of the “too Hollywood to believe” way I came to become a part of Harpo’s and Susan’s lives. I chose to write about that only after mom’s passing in 2002, carefully respecting her lifetime role as my mom, the parent. It is a weird story about rejection, abandonment, adoption, and acceptance that I believe many can relate to and understand the accompanying feelings attached to these issues that can affect a lifetime of one’s behavior. Available at Amazon, B&N, independent bookstores, and Applausebooks.com. New Years Day 2012, the Aero Theater in Santa Monica (1328 Montana Ave.) will be screening a double feature of Animal Crackers and Horse Feathers at 5pm. 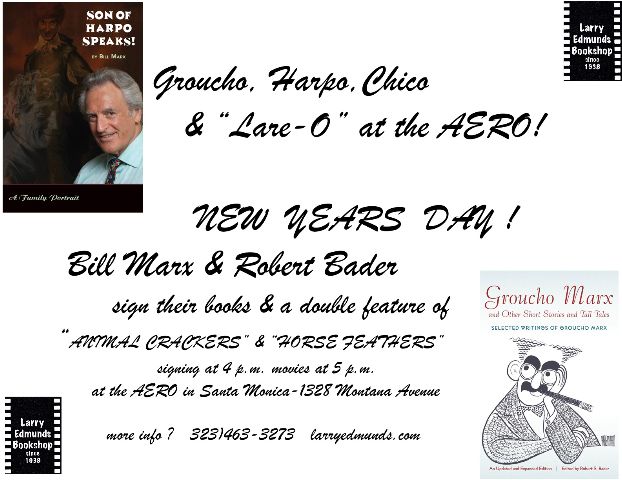 However, if you come to the lobby at 4pm, you can get autographs from Robert S. Bader, the editor of Groucho Marx and Other Short Stories and Tall Tales AND Bill Marx (the son of Harpo Marx), author of Son of Harpo Speaks! Books on sale by Larry Edmunds Bookshop in the theater lobby. Groucho Marx was a comic genius who starred on stage and in film, radio, and television. But he was also a gifted writer – the author of a play, two screenplays, seven books, and over 100 articles and essays. This newly expanded collection presents the best of Groucho’s short comic pieces, written over a period of more than fifty years between 1919 and 1973 for theNew York Times, the New Yorker, the Saturday Evening Post, Variety, the Hollywood Reporter, and other newspapers and magazines. Available from Applause Books and booksellers nationwide. Bill Marx is the last living person to have worked professionally with the three Marx Brothers, his uncles Chico and Groucho and his father, Harpo Marx. Because Chico and Groucho had siblings that had written about them, Bill Marx wanted to complete the Marx Brothers’ literary trifecta by authoring a book about the personal and professional relationships that he had with his father. Available from Applause Books and booksellers nationwide. Bill Marx (son of Harpo) Speaks! I suppose that because I am the last living person on Planet Earth to have worked professionally with the three Marx Brothers, those being my dad, Harpo, and uncles Groucho and Chico, one could say it is a distinct honor that could be considered both fortunate and dubious. It was in a time span extending over twenty-six years, starting with my being a prop man for Harpo and Chico in 1949 while touring the British Music Hall circuit, and ending with my accompanying Groucho on piano in his later years up until the time of his passing in 1977. Son of Harpo Speaks! by Bill Marx (available Nov. 15, 2011), in addition to offering a unique perspective of a very special man and revealing many stories never before in print, is also a book about a “too-Hollywood-to-believe” life-altering quirk of fate that ultimately brought him together with his parents. Bill Marx has been a musician almost his entire life. At 16, he became musical conductor/arranger for his father, Harpo Marx. Bill has studied composition at the Juilliard School and has written numerous concertos, including a first-of-its-kind double harp concerto. He has scored for motion pictures, television, theater, and ballet; concertized for years as a jazz pianist; and recorded many albums, including two with his father. His autobiography, Son of Harpo Speaks!, is the sequel to his father’s autobiography Harpo Speaks! (Limelight Editions).